Celebrate the Danville FallFest 2018, formerly known as the Danville Fall Crafts Festival, on tree-lined Hartz Avenue in downtown Danville from 10 am to 5 pm on October 20-21, 2018. In its 27th year, FallFest keeps with the season with family-friendly, safe, special events and entertainment. Be sure and catch the annual Children’s Costume Parade. FallFest features 150 outstanding artists from the western United States. Enjoy your favorite returning artists and the work of new artists in the jewelry, glass, ceramic, painting and photography categories. This year’s FallFest offers some outstanding dance and musical entertainment. Check out Next Step Dance Academy and the Danville Women’s Club dance Flash-Mob performances. The Classic Car Show shows off on Sunday. Don’t miss seeing an array of the coolest cars in the Valley. 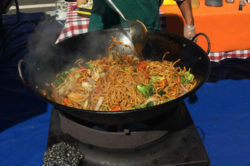 And this year’s FallFest has a great selection of ‘cuisine’ opportunities ranging from Chicken Skewers, Tempura Fried Vegetables, Kettle Corn and Hawaiian Shaved Ice. Also enjoy a local Danville brewery and two outstanding wine purveyors.